Jason was raised in Bethlehem Pennsylvania and joined the United States Air Force in 1998. Since his enlisting, he has been stationed all over the world. The Lord brought him and his family to Rapid City and to CCRC in 2014. 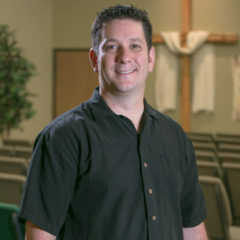 Jason has been serving as the CCRC worship team leader since 2016 and uses his passion for guitar to lead others in the praise and worship of Jesus Christ. Jason is also involved in serving the Youth Ministry with his wife Jana. He is happily married with four children. Ephesians 2:10 (NKJV)- For we are His workmanship, created in Christ Jesus for good works, which God prepared beforehand that we should walk in them.